Other than Field Day this was the big event of the year. Good food, Great prizes, Grand camaraderie. The party was held at The Jägerhaus again this year on Friday Dec 7 at 7 PM. The Grand Prize, won by Bev, KI6APH was a complete Heil Microphone set! 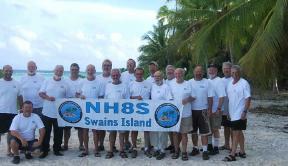 Club member Arnie - N6HC presented a program on the Swain's Island DX-pedition that was recently held. 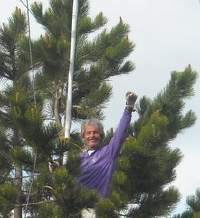 Arnie, has participated in many DX-peditions as a skilled CW and phone operator as well as an MD, an important person to have when away from civilization. Read Arnie's article in the October 2012 issue of RF (the club's newsletter). The OCARC held its yearly club auction in lieu of the October General Meeting. Chip Margelli - K7JA once again acted as auctioneer. There was lots of equipment for sale, and lots of buyers. Most of the equipment sold. Equipment donations for auctioning by the club helped bring the club's coffers up towards the black for the year! Thank you to all the donators. 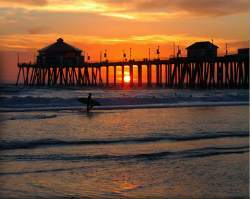 The OCARC held a beach party at the Huntington Beach City Beach from late afternoon until the beach closed at 10:00 PM. Some members showed up early in the day to enjoy a day at the beach. A fire pit kept members warm as they enjoyed Smores and good camaraderie. Thanks to Doug - W6FKX for organizing the beach party. The September meeting featured a presentation by Chip Margelli, K7JA about the 2012 WY7FD Field Day operation from high above Devil's Tower, Wyoming. Chip and Janet - KL7MF along with the rest of the WY7FD crew, battled high winds and lightning that nearly blew their antenna farm off their mountaintop QTH! As always Chip and Janet put on an entertaining and educational program. Fred Daniel - W6FNO gave a very informative presentation to the club at our August general meeting on how to handle interference from nearby radio stations. W6FNO's training is in engineering large VHF & UHF radio communications sites and systems. Club member Peter Putnam - NI6E gave a very interesting presentation to the club on solar energy. He detailed his 2,000 watt (12 panel) installation that feeds power into the SoCal Edison grid as well as his single panel installation that is backed up with batteries and runs his radio equipment. The 2012 ARRL Field Day was held on Saturday and Sunday. The club began setup on Friday afternoon. The club, operating 5A plus a GOTA station, made 2,264 QSOs, up 7% from last year. For more information on the OCARC participation in Field Day click here. For photos of this year's Field Day click here. For more information on the ARRL Field Day Contest in general click here. It was the Ken & Bob Show as our web-masters took you on a live tour of the OCARC website and pointed out where you can find pertinent information as well as find some of the hidden features. At our May general meeting longtime member Ken - W6HHC talked on Digital Amateur Television - DATV. 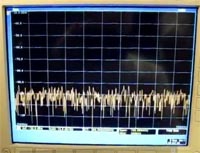 Ken is part of an international team project developing an inexpensive flexible Digital Television transmitter for the Amateur Service using software defined radio techniques and the power of the personal computer. This presentation was also given at this year’s Dayton Hamvention. The 63rd International DX Convention was held in Visalia, CA at the Holiday Inn Holiday Conference Center. This is the big DX event of the year. Many of our members attend every year. 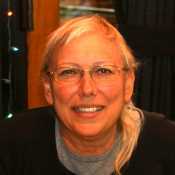 Congratulations to Kris Jacobs who won the 2011 Clipperton Award from the So Calif DX Club in Visalia. This is the "Rookie of the Year" award for the new SCDXC club member contacting AND confirming the most countries in 12 months. Once again many member of the OCARC, in conjunction with COAR supported the City of Orange Police Department in the Baker to Vegas relay race. Members provided communications and logistics support to the race team over the 120 mile, 20 leg race course. Friday was setup and the OPD team started Saturday at 4 PM Sharp. The OPD team finished 42nd overall out of about 280 teams with a running time of 16 Hrs 5 Min and 1 Sec. They finished third in their class even after being assessed a 10 minute penalty due to an injured runner. For more details check out the Baker to Vegas site. This meeting was held one week early due to a conflict with the Visalia DX Convention and Baker to Vegas Race. Dee Flint - N8UZE gave a wonderful presentation on Logbook of the World. Dee is a member of our club, formerly from Michigan. She likes contests and Field Day, and she likes having her QSO's confirmed. She was a star at last year's Field Day, though how she could keep straight her call (N8UZE) and the club call (W6ZE) is a mystery! With Dee's information members are getting set up on Long Book of the world, saving postage and getting those rare DX confirmations. Famous DXpeditioner Arnie - N6HC presented a talk and slide show on the very successful T32C DXpedition to Kiritimati (Christmas Island), part of East Kiribati (formerly Northern Line Islands) that is now governed by the Republic of Kiribati. This was another exciting presentation from N6HC who in involved in planning another DXpedition. The 2012 ARRL Southwestern Division Convention was held in conjunction with the Yuma, AZ Hamfest at the Yuma County Fairgrounds. 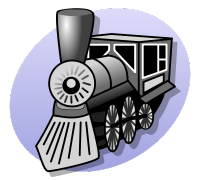 For information on the Yuma Hamfest click here. Margie Hoffman - KG6TBR spoke at the February meeting. Margie told us all about an all YL DXpedition to Curaçao, PJ2 land. Margie and five other YLs (Gail - K6GO, Rusty - AF6WF, Georgia - KI6LAV, Michelle - W5NYV and Ellen - N6UWW) operated PJ2T in the Caribbean in 2011. 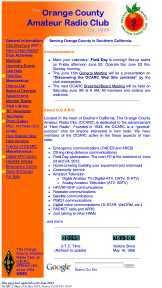 "What's new and Happening in the Orange Section". 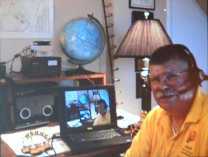 Carl is a dynamic speaker and big supporter of the ARRL and amateur radio in general. This was a very informative meeting. Nov. 13th, Oct. 10th, Sep. 8th, Aug. 11th, Jul. 14th, Jun. 9th, May 12th, Apr. 14th, Mar. 10th, Feb. 11th and Jan. 14th.